Our brightest, most advanced solid-state LED color-changing bulbs yet! This extremely eye-catching light bulb can be set to over 15 colors at the touch of a button, with 4 different light intensities! In addition, the bulbs can effortlessly cycle, smoothly fade, strobe, and flash through every color- offering a complete light show directly from any standard home light bulb outlet. Installation takes around only 10 seconds! Use the included IR remote control to select one of four color changing or fade programs, or any of the 16 colors offered. These brilliant RGB Color Changing LED Bulbs are great for parties, bars, corporate events, expo lighting, or mood/light therapy uses. Use in any standard incandescent socket. Have a sign currently illuminated with boring white light? Own a bar or restaurant and want to really make your decorations stand out? 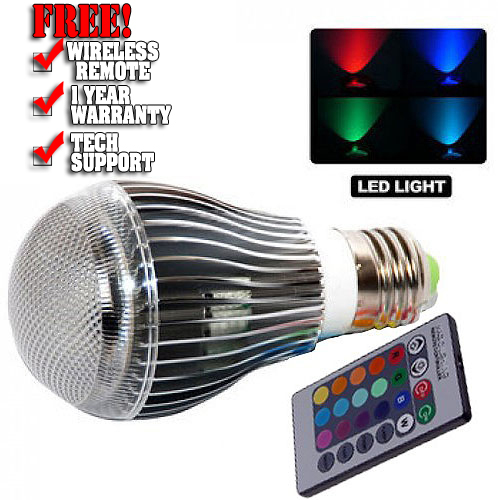 Well here is the answer, the RGB (red, green, blue) color changing LED lighting bulb.